Hyesang sang and oh how she sang! 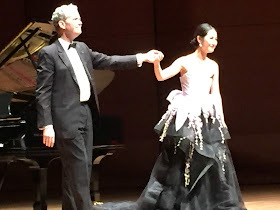 Up and coming soprano Hyesang Park gave a transporting recital last night at Alice Tully Hall. 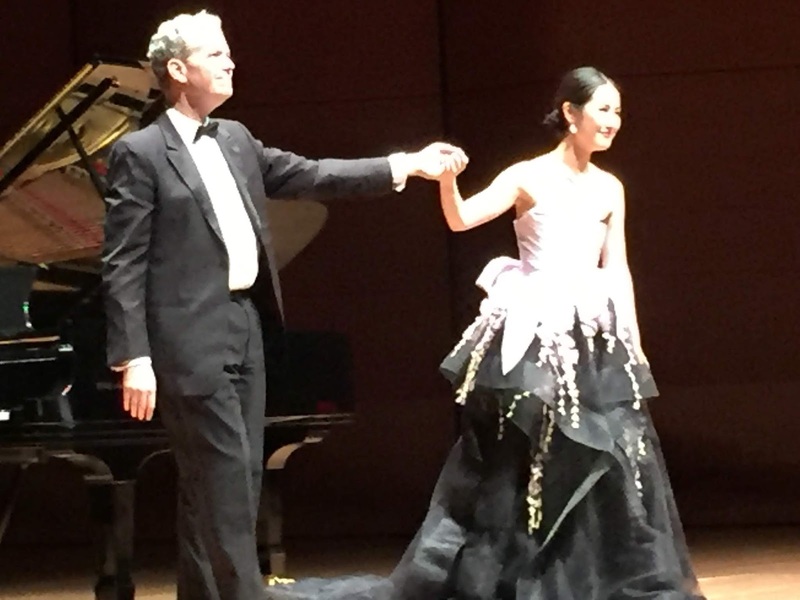 This was the 21st Alice Tully Vocal Arts Recital, established originally with a gift from the Alice Tully Foundation to promote exceptionally talented Juilliard singers on the threshold of a professional career. This recital had been postponed due to illness and, in the intervening period, this incredibly talented artist has crossed the threshold with engagements all over Europe. It was a recital well worth the wait. Ms. Park illuminates everything she sings with her crystalline instrument and her engaging stage presence. There are a couple of interesting qualities which set her apart. One is the self-effacing manner in which she invites the audience into the songworld. The other is the way she sets up the song with an intense but brief period of introspection. You can almost feel the emotional wheels turning. There is another aspect worth mentioning. Ms. Park's taste in fashion is as keen as her taste in programming. No fashion show could have dazzled the eye more successfully. In the first half of the program this beautiful young lady wore a dress of midnight blue with tiny scintillating "stars"; we called it "celestial". After the intermission she appeared in a gown that recalled a blooming flower. We know that it's the voice that counts but it doesn't hurt to delight the eye at the same time! And now, as to the music! It was a totally satisfying recital with piano collaboration provided by the estimable Brian Zeger who doesn't need our encomia. His playing is always supportive and there is no whiff of "showmanship". He certainly knows how to avail himself of the acoustics of Alice Tully Hall and ended many songs in a trailed off decrescendo that left the final note hanging in the air whilst we held our breath. Ms. Park knows how to work her prodigious skills such that they become art. Every song was given her full involvement. Phrasing always honored the intent of poet and composer. Exquisite control of dynamics lent variety and she used every color on her vocal palette. The program opened with five songs by Clara Schumann whose modest oeuvre we wish would appear on more programs. We particularly enjoyed hearing how originally she set the familiar "Liebst du um Schönheit", the Rückert text which was later set so differently by Gustav Mahler. We have heard it before but as it grows in familiarity, we increasingly appreciate Schumann's peaceful version. Not so peaceful was Rückert's "Er ist gekommen in Sturm und Regen" in which both artists created a storm of passion. Yet, our favorite was "Die stille Lotosblume" (text by Emanuel Geibel) with its meditation on mortality, symbolized by the singing swan. A set of four songs by Gabriel Fauré brought yet further delights. We loved the Gallic sweetness of "Nell" (text by Leconte de Lisle) and the meditative quality of "Au bord de l'eau" (text by Sully Prudhomme). These songs were new to us but the two with text by Paul Verlaine are well known--"Mandoline" and "Clair de lune". With a great artist like Ms. Park, an aural portrait is painted, one that reminds us of paintings by Fragonard. Reynaldo Hahn composed around the turn of the 20th c. but his compositional style often looks backward, as in our favorite "À Chloris" with its baroque turns. We found Ms. Parks' French to be quite lovely. After intermission we were gifted with three Korean songs. We never realized how "singable" this language is. We generally love folk songs for their simplicity and melodiousness. Our favorite of this group was the first --"Milyang Arirang" and Ms. Park gave it some passionate cries and highly expressive gestures. "Bird Song" was highly rhythmic and "Song of Loom" was interesting for the rippling figures in the right hand of the piano, with the left hand crossing over. It certainly suggested weaving to us. There were also many songs about mothers by varied composers. How pleased we were to hear Ms. Park sing in Spanish! It seems to us that Spanish composers of the 20th c. remained free of many of the 20th c. "advances" that we deplore. We particularly enjoyed Obradors' "Con amores, la mi madre" and Montsalvatge's "Canción de cuna para dormir" which is particularly evocative of time (1940's)and place (Cuba). Turina's Poema en forma de canciones gave Mr. Zeger an opportunity to shine solo in the extended opening "Dedicatoria", after which Ms. Park delighted us with three ironic songs "Nunca olvida", "Cantares" which began and ended with a stunning vocalise, "Los dos miedos", and "Las locas por amor". Her acting really put the songs across! We don't want to leave out Claude Debussy's evocative "Nuit d'étoiles" in which Mr. Zeger's piano created the twinkling of the stars. The text by Théodore de Banville was presented in Rondo fashion with the artists shedding new light on the "refrain" each time it recurred. After such a generous program, we weren't expecting an encore but we got not one but two. The first was in Korean and the second was "O mio babbino caro" from Puccini's comic opera Gianni Schicchi. No one could have refused Lauretta's imploring!